All tents & rooms have AC & TV facilities. All tents have 24 hours hot water services. We have generator back up. Idea cellular services have better internet connectivity here. Restaurant is open until late night & early hours! Walking path all around the farm land ! We would plan your entire itenary for your stay. We arrange pick up & drop facility if you are travelling by air or rail. Nearest airport is Keshod, Diu and Rajkot. Nearest railway station is at Somnath, Veraval, Jundagadh & Rajkot. We arrange bird watching tours. We arrange night walk tours in jungle areas. We arrange special folk dances of your choice. We arrange special arrangements for Senior Citizens. Your vehicle is allowed to park in front of your tent! We allow discounted tours, activities & stay arrangements for school children/college students. 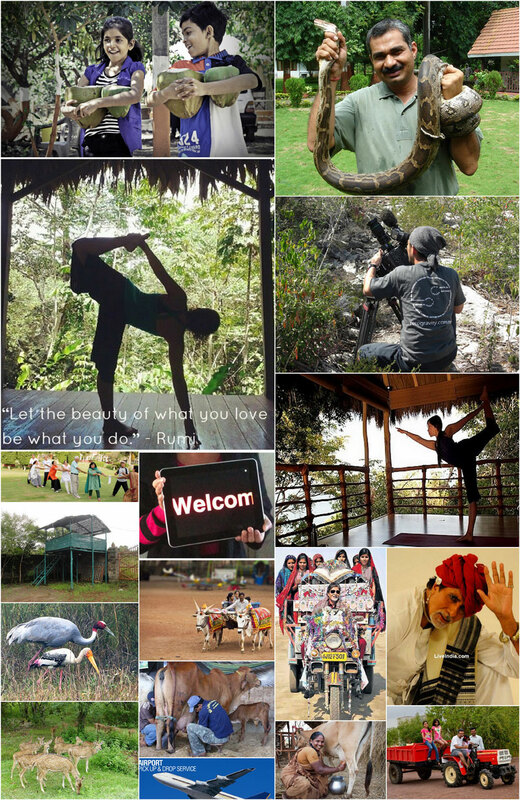 We allow special discounted rates for NGO organizations & Social activities camps. We offer very special rates for Senior citizens who desire prolonged stay! We also book our entire property for HR & Training activities.
" You don't have to live FOREVER, you just have to LIVE!"